Main draw play opened up Monday afternoon at the BB&T Atlanta Open held at Atlantic Station in Midtown Atlanta. The annual ATP World Tour 250 event is the start of the Emirates Airline U.S. Open Series that leads up to the 2014 U.S. Open. "We are an American, ATP (World Tour) event and we are all about American tennis," offered up BB&T Atlanta Open tournament director, Eddie Gonzalez at a press conference to start the week. "Look at the schedule today, it's all red, white and blue." Speaking of red, white and blue, the opening main draw match featured two Americans with impressive resumes in Sam Querrey and Steve Johnson. The two grew up playing against each other in Southern California, and they spent last week discussing the fact that they would more than likely renew their rivalry, sometime this summer. Early on, the prediction was that this would be a match dominated by serves. It came true as both players blasted aces on crucial service points. The fact that there wasn't one break point in the first set, meant that a tiebreaker was in the cards. Querrey jumped out to an early lead in the tiebreak with a mini-break and held on to take it 7-3. Johnson said “well done” to his opponent and friend. The second set was more of the same, but each player had a sniff at breakpoints. Querrey was the only player that could convert as he broke in the 12th game of the match, to take Johnson out of the singles draw. Querrey sighed as he met the press and said it felt good to get a win under his belt as it's a positive sign heading into the heat of the summer. "It's huge. This is the time of the year where I need to put my foot down. I need to jump back into the 20s." This is Querrey's first BB&T Atlanta Open and his first impression as he hit 20 aces, is the court fits his game. "It's a great place to play," said the former world top-20. "The center court suits my game; it takes a kick serve, but it rewards you." 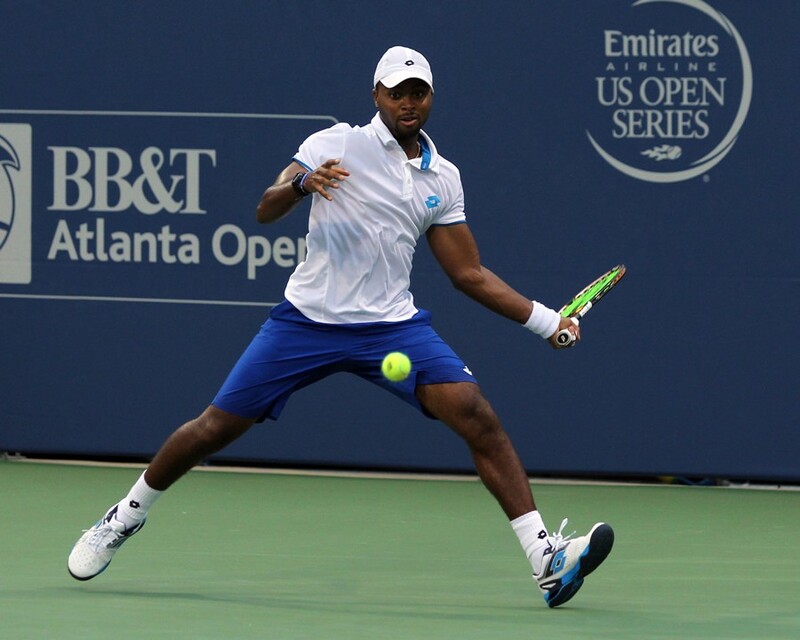 Next up on Stadium Court was another American looking to use Atlanta as a launching pad to the U.S. Open, Donald Young. Playing right in his hometown, Young had the crowd on his side, but Israel's Dudi Sela had other ideas. "I played very well, very solid, I had a good backhand," explained Sela. "I'm very happy with the win." Sela broke in the first game of the match and closed out the first set with another break to take the opener 6-3. Things then went from bad to worse for Young in the second set as he was broken five more times and could only muster eight points total in the set. A disappointed Young is looking for answers as he has only won one main draw match in the five-year history of this event. "I thought I was in a good state of mind. I haven't had good results at home. Nothing worked,” Young said. Two main draw doubles matches also took place on Monday as the German pair of Benjamin Becker and Frank Moser defeated a pair from the University of Alabama men's tennis team in Korey Lovett and Becker O'Shaughnessey. In the second evening match on Stadium Court, the American duo of Robby Ginepri and Ryan Harrison downed the British Brother act of Ken and Neal Skupski. First round main draw singles and doubles matches continue on Tuesday at Atlantic Station.